Havre de Grace: The Embodiment of Elegance- The last of the female triad to claim Horse of the Year honors, Havre de Grace was a blessing left for the track by her ill-fated sire Saint Liam. The bay mare’s name is French for “haven of grace,” and she certainly illustrated her propensity for elegance and balance during her years on the track. As if winning against some of the top males was not enough, Havre de Grade returned to female competition in the Beldame Invitational Stakes (GI) to trounce that field by 8-1/4 lengths, a group that included Royal Delta, that year’s forthcoming Champion Three-Year-Old Filly and eventual three-time winner of Champion Older Mare honors. Havre de Grace was purchased by Fox Hill Farm for $380,000 at the 2008 Keeneland September Yearling Sale. The young filly’s conformation, foundation mare pedigree, and lovely attitude grabbed the attention of her buyers, and she certainly rewarded their warranted infatuation. Originally scheduled to make her first start as a two-year-old on the turf, the one-mile race was moved to the dirt. Havre de Grace posed a slight threat but ultimately finished third in the maiden special weight. Trainer Anthony Dutrow then tried to place his young charge on the turf again, but the plan was spoiled for a second time. However, this time the filly overcame a slow break to win the mile-long race by 4-3/4 lengths. Havre de Grace slowly grew into her 16.2 hand body, and she reappeared on the racetrack in May of 2010 as a three-year-old. While Zenyatta was already far into her rampage of impressive victories, the graceful bay filly with the small star began to put herself together. Havre de Grace, under the hands of jockey Jeremy Rose, won an allowance victory at Philadelphia Park before trying two turns in the Go for Wand Stakes in which she finished second by a recalcitrant neck. Havre de Grace then hooked up with rival Blind Luck in the Grade II Delaware Oaks and the Grade I Alabama Stakes, losing each time by a nose to the year’s eventual Champion Three-Year-Old Filly. By grit rather than by blind luck, Havre de Grace finally gained the upper hand in the Cotillion Stakes (GII), winning by a neck over the quickly closing Blind Luck. However, the beaten rival carried ten pounds more than the beautifully created Havre de Grace, a fact that would dampen her accomplishment until she proved herself on more even ground. To complete her three-year-old season, connections sent Havre de Grace to run in the 1-1/8-mile Breeders’ Cup Ladies’ Classic (GI). The improving filly had not yet progressed enough to outrun multiple graded stakes winner and victor Unrivaled Belle, and for the third time in her life she finished behind runner-up Blind Luck. While Havre de Grace did finish a lacking third, she still ran well enough to leave the rest of the field behind by 7-1/2 lengths. For her four-year-old season, Havre de Grace was transferred to the barn of regular Fox Hill trainer Larry Jones and would be ridden for the remainder of her career by jockey Ramon Dominguez. The fresh team certainly prepared their new protégé well as the filly dominated Oaklawn’s Azeri Stakes (GIII), beating Blind Luck by 3-1/4 lengths while carrying identical weight of 115 pounds. Havre de Grace remained at Oaklawn to score her first Grade I victory in the Apple Blossom Handicap by three-quarters of a length over Switch, a multiple graded stakes winner in her own right. Finally having a taste of well-deserved victory, Havre de Grace returned to Delaware Park to shake off her competitors in the Obeah Stakes (GIII) on her way to a 2-1/4 length triumph. The graceful filly then met with familiar foe Blind Luck in the Grade II Delaware Handicap run over 1-1/4 miles. Havre de Grace gained the lead over the incredibly gritty Blind Luck but ultimately finished second by a nose, 18-1/2 lengths ahead of the Grade I-winning mare Life at Ten in third place. Havre de Grace’s slight loss to her most worthy opponent certainly did not deter connections from placing their mare in male competition. Their pretty charge was tasked with taking on some of the nation’s best boys in the Grade I Woodward Stakes, and Havre de Grace did not disappoint as she forged her way to the lead and won by 1-1/4 lengths over Flat Out, an eventual two-time winner of the Suburban Handicap (GII) and Jockey Club Gold Cup Stakes (GI). 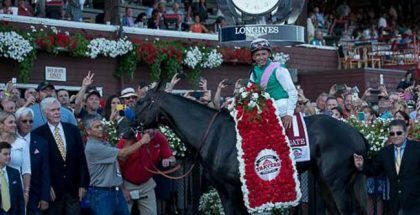 With that conquest, Havre de Grace achieved the status as only the second female to win the Woodward Stakes following Rachel Alexandra’s initial victory during her 2009 championship season. Like Zenyatta, Havre de Grace completed her season with an attempt to best the boys once again in the Breeders’ Cup Classic (GI) at Churchill Downs. Unfortunately, her result this time was much more dismal. Throughout the race, Havre de Grace was bumped, and into the stretch she drifted, wasting precious ground and time. While she was able to manage a late gain, it was not enough, and she finished fourth behind the good runners Drosselmeyer, Game On Dude, and Ruler On Ice. However, that sub-par performance did nothing to diminish her overall season accomplishments. Havre de Grace was crowned with distinctions as the 2011 Champion Older Mare and Horse of the Year, the highest accolades available to honor her impressive season. Connections were not content to sit on their laurels and instead envisaged a five-year-old career for their luminary. Their purposes were initiated by Havre de Grace’s easy 4-1/2 length victory in the New Orleans Ladies Stakes, but as all too often happens, an injury forced a change of plans. 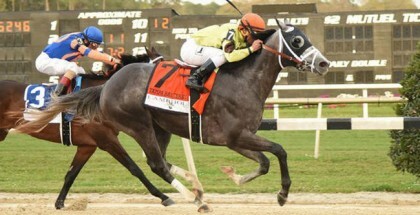 Due to a ligament injury in her right front ankle that would only worsen with intensive racing activity, Fox Hill Farms made the call to retire Havre de Grace on April 23, 2012. Out of 19 starts, Havre de Grace won 9 times, placed 4 times, and finished third twice with her singular off-the-board finish coming in the form of her fourth-place finish in the Classic. With such an impressive record and earnings of $2,586,175, Havre de Grace was certainly a desirable broodmare. The opportunity to purchase her arose when Fox Hill Farms decided to sell her in the 2012 Fasig-Tipton November Sale. Thus, Havre de Grace was purchased by Mandy Pope of Whisper Hill Farm for a commanding $10 million price-tag, and she is now living out her life as a broodmare under the care of her new farm. As a daughter of Saint Liam, the value of Havre de Grace was certainly enhanced. Saint Liam was the 2005 Horse of the Year and Champion Older Male, and his progeny were greatly anticipated. Tragically, Saint Liam served only one season at stud before being euthanized due to a fractured hind tibia, consequently producing a mere 96 foals who went on to race. Damsire Carson City was a multiple graded stakes winner and was best known as a good broodmare sire producing mostly sprint to intermediate distance runners. Havre de Grace’s dam was Easter Bunnette who hails from a strong female line of runners and producers. While Easter Bunnette was a winner at Suffolk Downs during her own racing season, she did not produce any other foal at the level of Havre de Grace. However, Easter Bunnette was a daughter of the stakes winner and multiple graded stakes placed mare Toll Fee. Toll Fee was much more successful as a broodmare, producing the graded stakes placed over hurdles gelding Devil’s Egg (by Devil’s Bag) and consistent runner and winner Brainstorm (by Smart Strike) who raced from 2005 until 2011. Havre de Grace’s third dam Toll Booth certainly offers the most class in her pedigree. Toll Booth was named the 1991 Broodmare of the Year after producing Plugged Nickle, the 1980 Champion Sprinter, and stakes winners Toll Key and Tokens Only. Past her fourth dam, Havre de Grace’s pedigree mostly consists of European-breds. As a highly regarded broodmare prospect, Havre de Grace has been bred to nothing but the best in terms of the most popular and successful current stallions. In 2014 she produced a Tapit filly, and earlier this year she produced a colt by War Front, both leading sires. Time will tell if her offspring will be able to compete as well as their graceful mother. Havre de Grace’s achievement of Horse of the Year of 2011 marks the last time a filly or mare has earned those honors. Regardless of whenever another female rises to take that distinction, Havre de Grace will still undoubtedly be recalled for her feats of pretty finesse and elegant ease on the racetrack.